Hello again! I can’t believe it’s already been a month since my last update. Time has absolutely flown past, and it’s hard to come to terms with the fact that I now only have one month left of this internship. 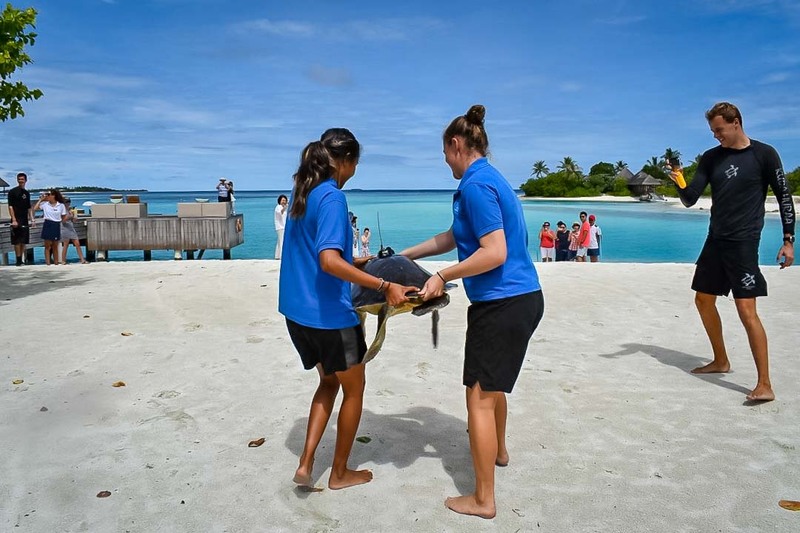 I have spent this month immersed in turtle duties, leading more snorkel trips and marine life presentations and have even started helping out with the coral team. I have been guiding more snorkel trips, and have been thoroughly enjoying the time I get to spend in the water with all the incredible creatures that live on the reefs in the Maldives. I don’t think I could ever tire of swimming an arm’s length away from blacktip sharks, being surrounded by schools of redtooth trigger fish or being face to face with a Hawksbill turtle on the reef. 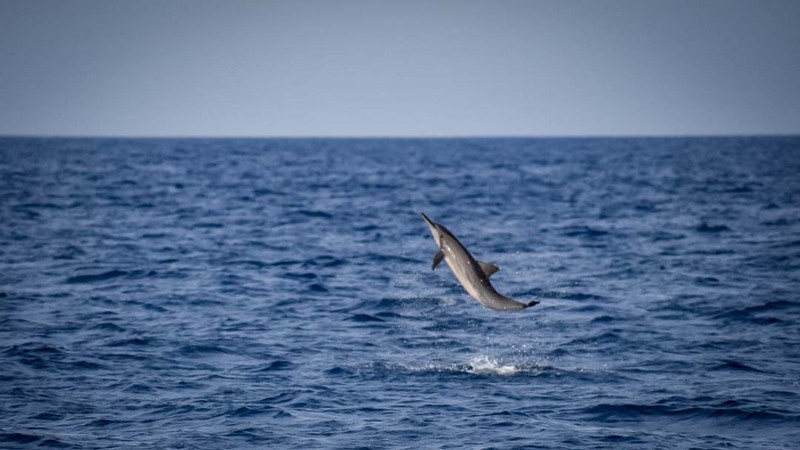 I have also been trying to spot pilot whales on our dolphin cruises, as this time of the year they begin to pass through the waters around Kuda Huraa. No luck in seeing them yet but my hopes are still high! This month I’ve also had several opportunities to help the coral biologists in collecting and building coral frames. The coral fragments are collected from various locations in the channel of the island. Fragments of the species Acropora are harvested from live colonies along the reef and are attached to the coral frames, which are then placed back into the sea in the hope that the fragments will grow and new colonies will be established. In 2016, the reefs around the island lost up to 75% of their coral during a devastating El Nino event. It has been great to see all the progress that has been made by the team since then, to help recreate healthy reef systems again. It has been a very exciting month with the turtles at the centre, with the arrival of some green hatchlings from the nesting beach at Landaa Giraavaru and the release of one of our mature Olive Ridley’s! At the beginning of April we received 4 green turtle hatchlings, 1 of which was brought to us as it had deformations on its carapace. The other 3 were brought in as they had emerged from their nest much earlier than the rest of their clutch and the risk of releasing them by themselves was too high. On 23 April, we received another 7 hatchlings! Since arriving at Kuda Huraa they have already grown so much, almost doubling their weight in the span of a few weeks. It has been really interesting to watch them grow as you are able to visually see the changes in the size and shape of their carapace and flippers. Over the past weeks they have also become more confident in the water and can easily dive down to the bottom of their pool to feed. The hatchlings will continue to live here at our Centre as part of our ‘Head Start’ programme. 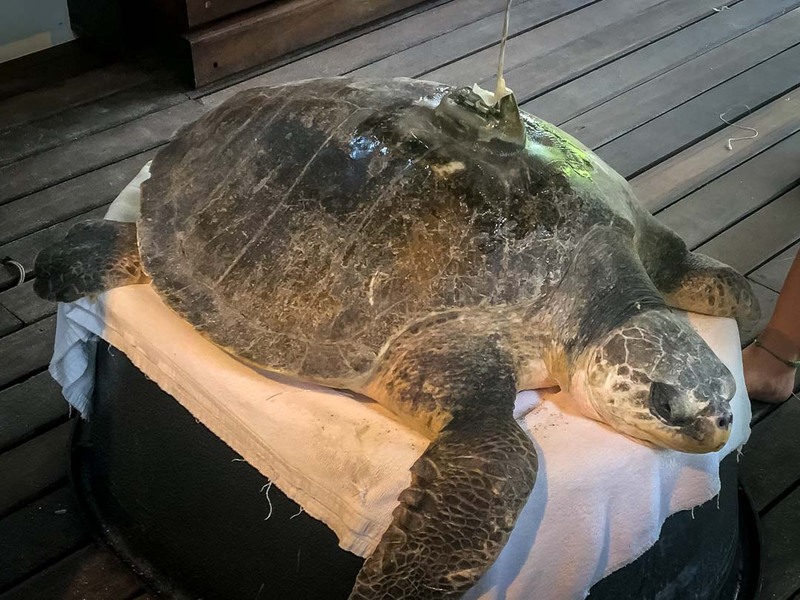 ‘Stevie’ the Olive Ridley was finally ready for release after spending 2 months in our rehabilitation centre, overcoming the buoyancy complications she sustained whilst being entangled in a ghost fishing net. After completely recovering from her injuries and showing us that she was able to dive and rest easily at the bottom of her pool, Stevie convinced us that she was ready to go back to her home in the ocean. Stevie also happened to be the perfect candidate for a satellite tag, which allows us to track her movement and migration patterns. I had previously seen satellite tags on sea turtles but had never actually attached one before, so this was a very exciting experience. The day before her release we attached the satellite tag onto Stevie. The process started with sanding down the area of her shell where the tag would be placed, then using clay and layers of fiberglass sheets and epoxy to attach the tag onto her carapace. The process was finalised by applying a few layers of paint with antifouling properties, to help keep the tag secure and protect it from the harsh elements of the sea. With her new accessory in place, Stevie was all ready to go, and on the morning of 20 April she was sent back to her home in the ocean. We are now able to track her movements as she makes her way around the Indian Ocean. 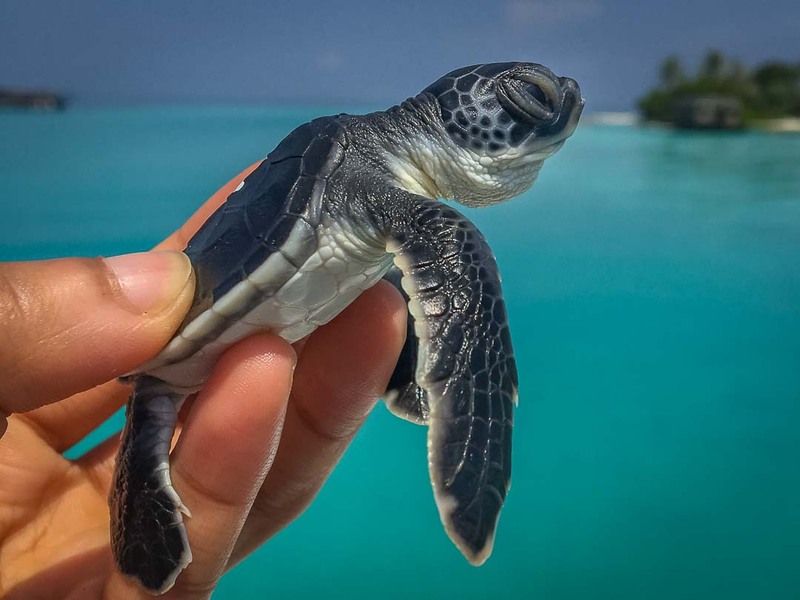 I have also been continuing with contributing to the ‘Maldives Sea Turtle Identification Project’, mainly focusing on sorting through the new turtles which have been identified by members of the public and adding these into the database. I now head into my final month here at Kuda Huraa, and as sad as it is to know that the time I have left here is running out, I look forward to all the new experiences the following month will bring (update: here).